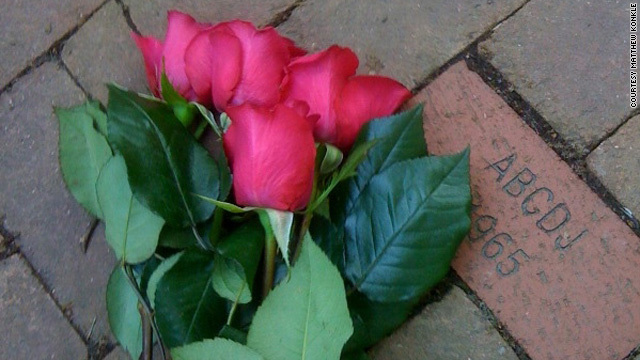 For Bob Greene, an unforgettable friend lives on through his voice and through a simple brick. Greene: "Like friendship itself, the voices never die"
Editor's note: CNN Contributor Bob Greene is a best-selling author whose books include "Late Edition: A Love Story" and "And You Know You Should Be Glad: A True Story of Lifelong Friendship." (CNN) -- The voice is what you end up missing the most. If you've ever had a friend who has meant the world to you, and the friend has died, you'll find yourself half hoping to hear the voice even years after the friend has gone. I have a feeling that there are more than a few of you reading these words today who know exactly what I mean. So it can hit you like a small miracle when, against all odds, the voice of your friend returns. Jack Roth was my best friend from the time we were 5 years old. He died in 2004 at the age of 57; a man who was not a smoker, he nonetheless was cut down by lung cancer. For all those years, from the time we were boys, we never stopped talking to each other, about big things and small. There is not a week that goes by when I don't want to talk with him again. On the cusp of every new summer for the last five years, Jack's wife, his daughter and we who were his friends have held a charity race in his memory through the streets of the central Ohio town where we grew up: the streets he loved. We did it again this year, on a warm and gorgeous Sunday. But there was an additional kind of warmth this year because, in a pair of ways none of us could have predicted, Jack's voice was there with us again. A fellow named Gary Bender discovered an audiotape. When we were all 12 years old, Gary, it seemed, was a member of the audio/visual club at our junior high school. He ran the public address system at assemblies. It turns out that he recorded reel-to-reel tapes during the presentations. Now living in California, he was going through some old boxes recently and found a tape on which boys and girls were being nominated for class offices. "Mr. Stolzenberg, members of the faculty, and the student body ... As you know, I represent Gary Allen Herwald ... Gary has fine leadership abilities ... Gary is kind to all people he encounters, whether it is on the playground, classroom, or athletic field. ..."
The last time I heard Jack's voice, he was dying. The voice was so weak, struggling for air, filled with sadness that he was leaving his wife and daughter behind. So to hear the voice of Jack when life was new, for him and for all of us ... well, I listened to that tape over and over again. My oldest friend, rediscovered. And then I found another version of his voice. Unbeknownst to me, Jack, even in his final months, was writing letters of gratitude to those who had treated him thoughtfully. One of the people to whom he wrote was a man named Gary Zimmerman (I know -- a lot of Garys in this tale), who lives in New York. "Oh, Gary. That's so kind of you. I just can't tell you what it means to my family and me to know of your feelings for us. Although my life continues to become more difficult and it's harder to see a future that resembles anything like normalcy, I pray that someday we will once again find peace and good health. God bless you for your prayers. ..."
Thus it was with those newly found voices in my ear -- the spoken voice of Jack at 12, trying so hard to do a good job at the nominating assembly, the written voice of Jack at 57, using some of his dwindling energy to send his thanks to a man who had been nice to his family and him -- that I arrived in Ohio for this year's race in his honor. Gary Herwald -- that same Gary Herwald who, half a century ago, Jack had nominated for class president -- had come to town, too, to run in Jack's race. He picked me up and we rode over to the starting line together. When Jack and I were young, there were five of us who were best friends. We called ourselves ABCDJ -- Allen, Bob, Chuck, Dan, Jack. In the town where we lived, there is a community plaza upon which residents and former residents are invited to purchase bricks with their names carved into the surface. Before Jack died, he purchased a brick. But he didn't have his name carved into it. Instead he had those five initials inscribed: ABCDJ. He told me he did it just so there was "something to show that we were once here." On race day, I walked to where the brick is. I think I can just about find it with my eyes closed. I looked down at it, and for a moment I did in fact close my eyes and heard again his voice when he was young, his voice when he was dying. If you are lucky, and I know that some of you are, you can do the same thing as you think about your own best friends who now are gone. In the ways that matter, their voices are always present; they have a way of finding you just when you need them the most. Like friendship itself, the voices never die.